By permission of the Air Force Museum of New Zealand, Dambusters is coming to Te Awamutu Museum! Explore the planning that went into the infamous raid on the Ruhr Valley dams, the science behind the ‘bouncing bombs’ and the aftermath for both 617 Squadron and the residents of the Ruhr Valley. The exhibition includes fascinating interactive components to highlight the science and ingenuity used during the raid. 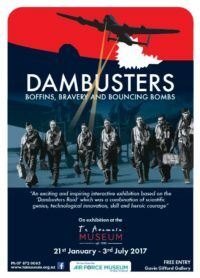 Dambusters is only here for a strictly limited time, so don’t miss out, fly in today! In conjunction with Dambusters, we will also be showcasing an exhibition about a local hero, Les Munro. This features information gathered by MOTAT and the 2015 TVNZ documentary ‘Relucant Hero’.